Although a bride and her wedding dress receive much more attention, a groom must also do his best to look great at his wedding ceremony. But while buying your groom’s suit seems to be a very easy task, in reality, the things are more complicated. In truth, you can’t simply wear any suit you come across at a men’s suit store. The choice of the proper groom’s attire depends on many factors: from the wedding format to the groom’s body peculiarities. 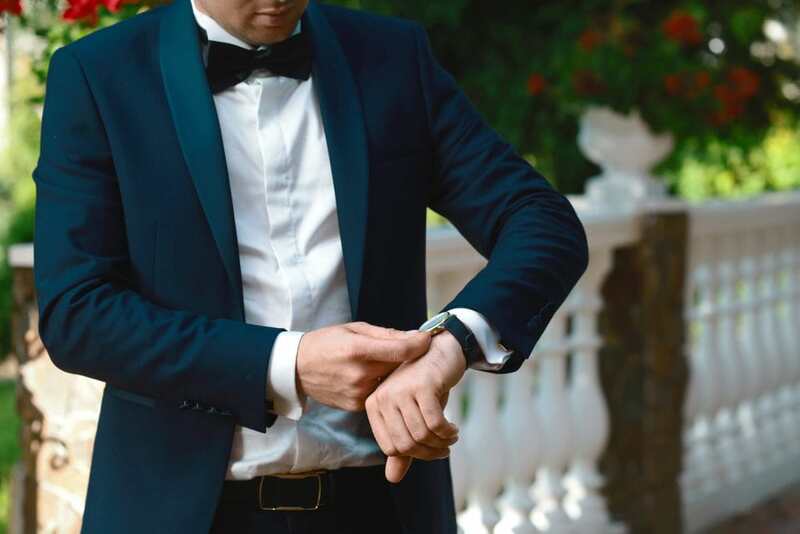 In order to make your life a bit easier, we’d like to share some tips as well as possible ideas of groom’s wedding outfit. Dress for your body type. Though this rule is very important for girls, who seek for the most flattering wedding dress silhouettes, it’s not less important for a groom to have a good fitting suit. If you are tall, minimize the vertical lines, which may add some visual height. The best choice is a shawl collar tuxedo with clean lines. If you, vice versa, need some more height, consider wearing a single breasted suit or a tuxedo. Also, take into account that long breasted jackets may make you look slimmer while double-breasted suits may make you look more bulky. Stay comfortable. 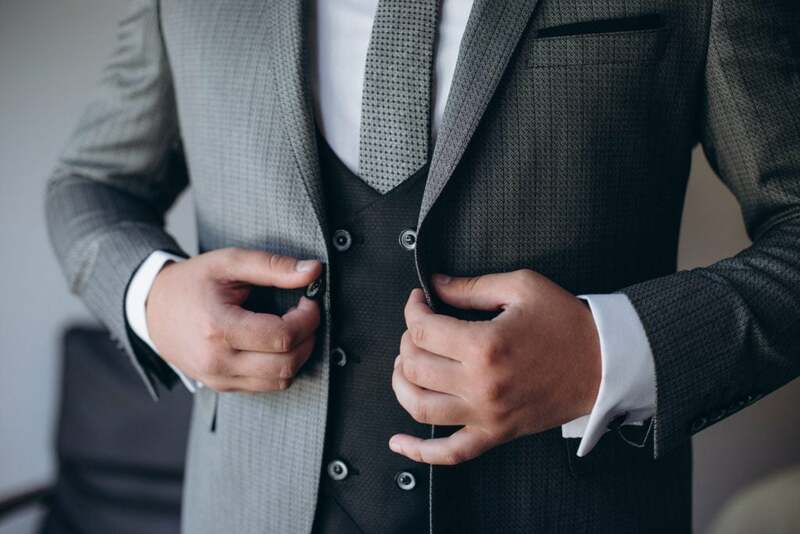 Of course, a formal groom’s outfit may feel different from the clothes you usually wear. However, it doesn’t mean that you need to suffer from inconveniences. The size must be proper and you must move freely in your suit. The most traditional colors of groom’s wedding attires are black, grey and dark blue. These colors suit anyone and can be used in any season. However, you can be more creative and go for other colors like light shades of blue, brown, beige and whatever color you like. But take into account that white suits as well as the ones of other light colors are more suitable for warmer seasons. Moreover, make sure that the color of your suit looks harmonious with your bride’s dress. The choice of the fabrics for your wedding attire, first of all, depends on the season. Thus, wool, worsted and wool-blended suits are of very good quality and will serve you for many years, but they are suitable for fall, winter and early spring weddings only. If you are getting married in spring or summer, it’s better to opt for lighter materials like linen, which is highly breathable. The more budget friendly variants are suits made of cotton and polyester. Stick to the wedding format and location. The choice of the suit also depends of the wedding format. While tuxedos and tailcoats are often used for white/black tie weddings, the groom’s outfit can be more relaxed for a casual wedding. Also, wedding attires for grooms may differ depending on the location. Luxury weddings at restaurants, mansions and hotels demand formal attires, while the dress code for an outdoor wedding is more relaxed. Take into account your bride’s dress. It’s important that a bride and a groom look harmonious. For instance, it will be weird if you wear a tuxedo, while your bride has a simple wedding dress. While white and ivory wedding dresses are well-combined will all the colors of groom’s outfit, the case is different with colored ones. For instance, if your bride has a light blue wedding dress, it’s good if you have this color in your outfit. For example, opt for a light blue shirt or tie. 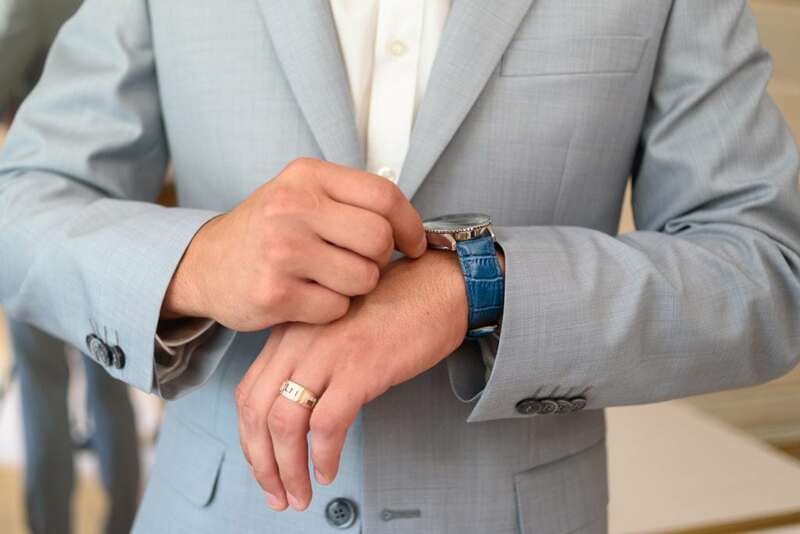 Though a groom’s attire doesn’t need so much accessorizing as a bridal dress, there are a lot of options of how you can add charm to your outfit. The most usual groom’s accessories are neckwear, which is either a necktie or bow, a waist coat or vest, a boutonniere, cufflinks and studs. If you have never dealt with suits and wedding attires, you can easily get lost in a big variety of them. 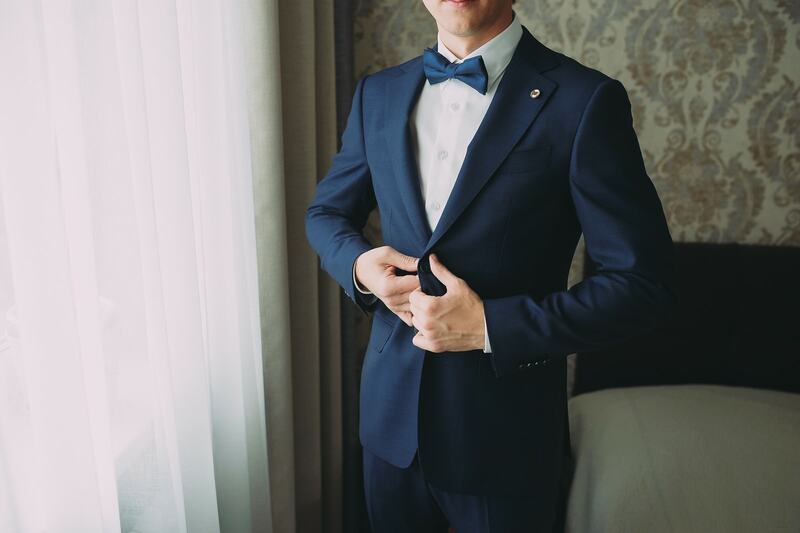 In order to help you to understand what you need, we recommend to have a look at the following types of groom’s wedding outfits. A morning suit is usually worn for daytime formal weddings. It consists of a black jacket with a large tail at the back to the mid-thigh or knee. 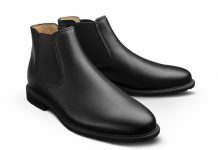 It is usually paired up with grey trousers or striped ones and a double-breasted waistcoat. Tuxedos are always in trend. They suit any formal wedding. Unlike usual wedding suits, tuxedos always have a satin trim, which adds some glamour to the groom’s look. As a rule, satin is featured on the outside of the lapels, buttons and trim of the pockets. Also, the trousers may have a line of satin down the outside. Traditionally, a cummerbund is worn with a tux, but many modern grooms don’t wear it. A tail coat, which is also called an evening tail suit, is the most formal type of outfit. It usually consists of a black tailcoat, which is worn open and features two long tails at the back, a black pair of trousers, a white shirt with a detachable collar, a bow tie and Marcella waistcoat. A lounge suit is a more relaxed type of an outfit. It’s one of the best options for a beach wedding, especially if it’s made of linen. Such suits are often of light colors and are single breasted. They can be worn with or without tie. If you plan a semiformal or casual wedding, a suit will be a good option. There are many possible styles of suits. For example, it can be a double breasted suit with 4-6 buttons, which is also called an Italian style suit. Such suits are more tailored and suit tall or slender men. Business suits can also be worn for weddings. They suit civil, casual and semi-formal wedding celebrations. They can be single or double-breasted, feature 2 or 3 buttons and a waistcoat. Business suits are usually worn with a dress shirt and a tie, which can be both solid or patterned. Casual weddings allow many deviations from traditions for both brides and grooms. 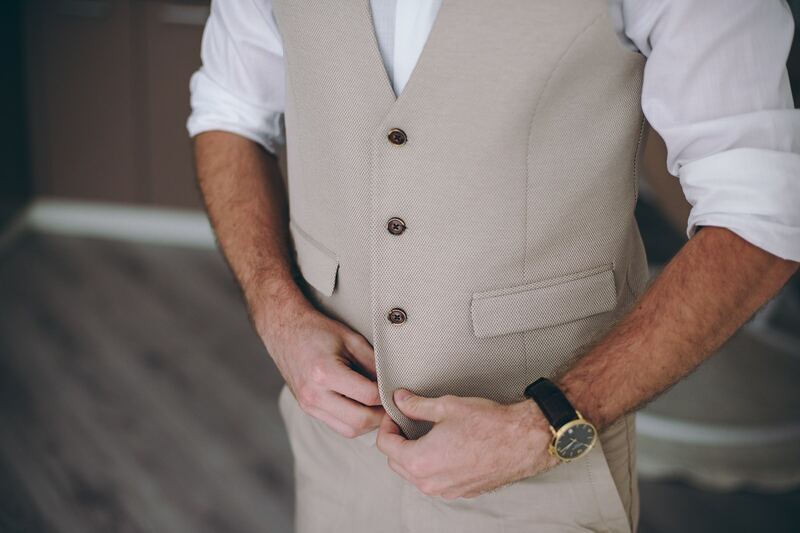 For example, a groom may refuse from wearing a jacket and use a waistcoat instead. Or, if you want to wear neither a jacket or vest, you may complement your look by wearing suspenders. If you know how to wear suspenders, you will look cool if you have a vintage, beach or country wedding. Also, casual weddings are appropriate for wearing mismatched trousers and jacket. For instance, you may have a black pair of trousers and a light grey jacket. Or, another option is to have trousers of a neutral color and pair them with a bright, maybe even patterned, shirt. In a nutshell, it’s not so hard to understand what type of suit you need if you already know the wedding format and location. But the most important is to choose an outfit, which fits you perfectly and highlights your individuality. Remember that a groom mustn’t look brighter than a bride, but it’s extremely important that he looks handsome and stylish as well as looks harmonious with the bride.